Why such a strange and weird motions? Real car, even racing one, doesn't behave this way, does it? How many people can drive simulator without getting sick? If you have these questions, you should try out our motion simulator. You will figure out what the simulator is intended to simulate. It is not the moving of a car, as you may think. Simulator primarily simulates forces to a driver. How do the people sense motion? The first sensors are eyes. You are looking out of a car or on a computer screen and you see where you are moving. But it is not all. Eyes are not the only sensors and a computer can't serve as a perfect simulator. Neither with best game and best graphic card and screen available. There is another sensor - inner ear with its vestibular system. It senses balance and motion. When its output doesn't fit with signals from eyes, you can get motion sickness. So, the motion simulator must stimulate inner ear synchronously with eyes. Platform motion must correspond with picture on the screen. Last but not least are touch sensors in hands and back. They sense vibrations from a driving wheel and seat. These sensors are fastest motion sensors. The simulator tries to simulate force on a driver in most situations, like acceleration, deceleration, turns etc. There are many types of simulators using different techniques to reach this goal. The simplest ones use steering wheel and seat vibrations only. Simulators with 3 rotation DOF (Degrees Of Freedom) allow roll, yaw and pitch. Simulators with 4 DOF add heave. These 3DOF or 4DOF simulate acceleration or deceleration by gravity forces as a result of forward or backward tilt of the seat (pitch). When the seat tilts backwards, gravity pushes you to the seat. It simulates acceleration. When the seat tilts forwards, gravity pulls you from the seat. It simulates deceleration. Many simulators have pitch axis under the seat. It's simple and saves place. But it has drawback. When the seat pitches to backward tilt around the axis under seat, you are pulled from the seat for a while. This supresses an acceleration effect. And invokes disbalance of your senses. Deceleration effect simulation has similar problem. Our 4DOF simulator has pitch axis above the driver. When the seat pitches to backward tilt, you are pushed to the seat. It corresponds with gravity force and supports acceleration perception. All senses are balanced. The higher the pitch axis is, the better. Thus, simulator can use rotational motions to simulate acceleration and deceleration. And it can look unusual, when you have your legs as high as your had. But you shouldn't care of this. You are pushed into the seat and you have to feel the acceleration force. Then, you shouldn't see scene around you for better simulation. Dark room or at least a monocolour curtain can help a lot. A helmet can help too. Helmet restricts scene to screen and its weight support acceleration forces. Helmet is not for safety which is sufficient when operating instructions met. 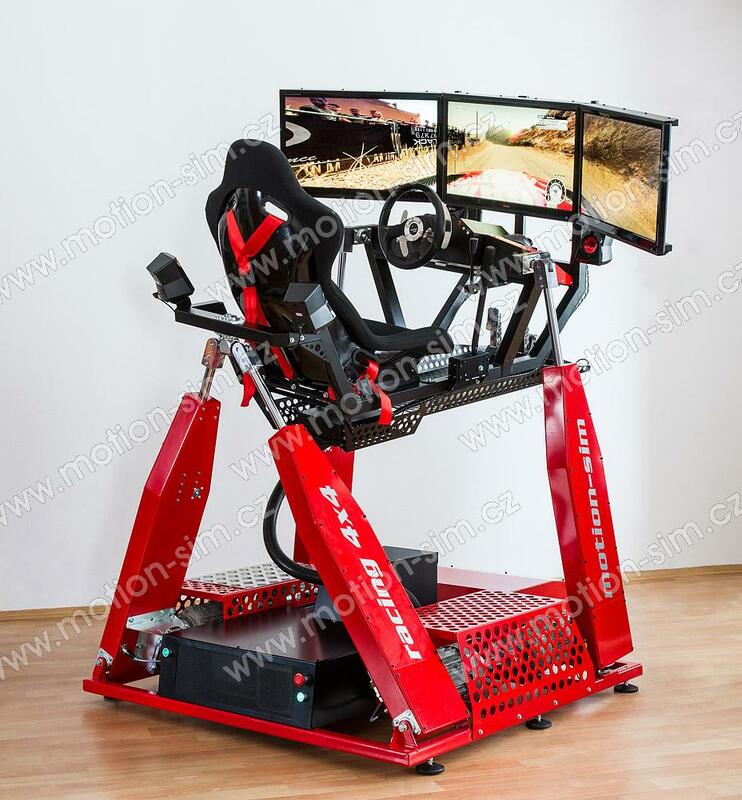 Come and try our racing simulator ! !